Why is our place magic? Why are its islands shaky? Why are our mountains tall and our forests green? Why are some lakes so blue? What happens below the waves? Who used to live here? What changed when mammals arrived? What happens in the dark? 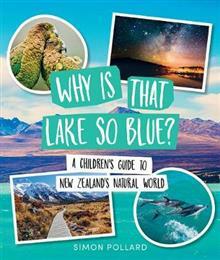 In this fun-filled, fact-rich book, award-winning science writer Simon Pollard shares the magic, secrets, mysteries and marvels of Aotearoa New Zealand's natural world. Dr Simon Pollard is a spider biologist and award-winning natural history photographer and writer. He has written and illustrated a number of children's books in New Zealand and the United States and has twice won the LIANZA Elsie Locke non-fiction book of the year. In 2017 his book for Te Papa Press, The Genius of Bugs, was shortlisted for the New Zealand Book Awards for Children and Young Adults. Simon has also been an advisor, scriptwriter and presenter on a number of natural history documentaries, including the BBC's Planet Earth. In 2007 he was awarded the New Zealand Association of Scientists' Science Communicator of the Year Award. He is a former curator of Invertebrate Zoology at Canterbury Museum and adjunct associate professor in the School of Biological Sciences at the University of Canterbury.